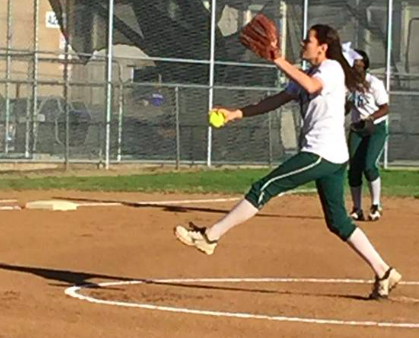 Helix's Shareena LaChance delivers a pitch on Tuesday. ESCONDIDO (3-9-16) — For the second time in a week, the Patrick Henry Patriots took on the West Hills Wolf Pack Tuesday (Mar. 8). 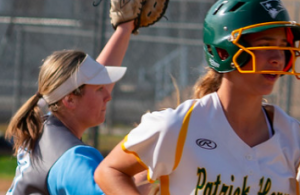 This time the two teams met in the Cougar Classic at Kit Carson Park, and again it was a repeat of their previous contest as the Patriots won 6-2. The Patriots as in the previous encounter were able to do some damage in their half of the first inning. Leadoff hitter HANNAH McEWEN drew a walk and moved up on a basehit by CASSIE VAN TIL. DANI ROMERO would knock in McEwen on a single, JOSIE GONZALEZ slashed a single that scored Van Til, and SAVANNAH CHAPMAN knocked in a couple of runs with a single to round out the scoring at 4-0. Patrick Henry would extend their lead to 5-0 thanks to a run in the bottom of the second inning. West Hills would finally get to MADISON JAMES who up to this point had allowed only 2 hits. SIERRA SCHLICHTING (2-3, RBI, R, HR) with one down took the 2-2 count and blasted a solo shot to make the score 5-1. They would draw a couple of walks in the inning by ALEX GUAY and PAIGE BOWLER but unfortunately couldn’t convert as BROOKE SNYDER grounded to short for the final out of the inning. The Wolf Pack pushed across their other run in the top of the fourth thanks to ALEXIS HERRERA (1-3, R) who came around to score after slicing a two-out single. Patrick Henry tacked on their final run in the bottom of the fourth on a sacrifice fly to right field by Romero that scored McEwen. For the second time in a row, RYLEIGH DOBYNS took the loss in the battle of the 2 aces as she tossed 5 innings, gave up 6 runs of which all were earned on 8 hits while walking 3. James for Henry picked up the victory as she went the distance, giving up 2 runs of which only 1 was earned on 6 hits while walking none and fanning 5 on the day. SYDNEY VATES, of Santana, has the game ball in hand following her game-winning grand-slam on Tuesday. SANTANA 4, OLYMPIAN 1 – It is said that sports creates memorable moments of a lifetime and who could argue as there have been many over the years with many to win contests. A moment such as this occurred on Tuesday (Mar. 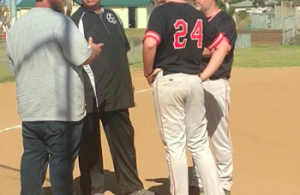 8) as the Santana Sultans took on the Eagles of Olympian High at the Cougar Classic at Kit Carson Park and came away with the 4-1 victory. 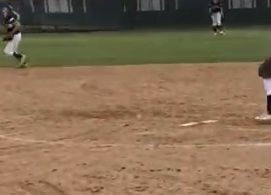 The contest was going back forth as both teams held each other scoreless but the Olympian Eagles were finally able to break through against MADDY MENDEZ who was making her varsity pitching debut for Santana and plate a run in the top of the third inning to lead 1-0. Despite outhitting the Eagles, the Sultans just couldn’t get anything going with a timely hit and the offense sputtered. Santana was running out of opportunities and it looked like they would be the hard luck losers of a close contest but then all of sudden an opportunity appeared. The Eagles’ starter who was doing a good job was able to get a couple of outs and then she walked a batter, the Eagles coach then came out and brought in a relief pitcher. This was a head scratcher to many as the starter had done a good job. The Sultans were able to draw a couple of walks including one by MACKENZIE BENNETT to load the bases with two outs. So with two outs and the bases packed, up stepped SYDNEY VATES to the plate. She was able to work the count until it went full. With everyone in the stands on their feet waiting in anticipation, the drama was rising. Vates stepped in and waited, the Eagles hurler set and let the pitch go right down the middle and Vates did her best MICKEY MANTLE impersonation and slammed the pitch deep and high in the air for a moonshot over the center field fence and up the hill. The bomb shot landed an estimated 240 feet for the game winning walk-off grand slam to give the Sultans the victory and a memory that will last a lifetime as well as a great flair of the dramatic. There was no doubt about it when the ball went off the bat, the fans roared and many even high-fived each other and all the Sultan faithful were elated. Vates rounded the bases as her teammates mobbed her at home plate and when she crossed everyone wanted to high-five her. “I was looking to just get a hit and I knew I was going to make contact. The pitch came and it was right down the middle which I knew was my opportunity,” said Vates when asked about her game winning heroics. Besides getting the victory, Mendez also helped her own cause as she went 2-4 at the plate. The Sultans pounded out 9 hits on the night including a couple by RACHEL WILSON who went 2-3. STEELE CANYON 9, HILLTOP 1 – In Cougar Classic action at Kit Carson Park, the Steele Canyon Cougars were able to show their dominance in the 9-1 victory over the Hilltop Lancers, Tuesday (Mar. 8th). Hilltop after shutting the Cougars out in the top of the first were able to get on board first to take a 1-0 lead thanks to a leadoff triple who would score on a groundout. Steele Canyon in the top of the second was able to push across three runs and never looked back. All of the damage done by the Cougars was done with 2 outs in the inning. Things got started when NICKI DePAOLA reached on a fielder’s choice, she would be replaced by JASMINE ALVARADO (2 R) as a courtesy runner, EMMA DODSON (1-2, 2 R) reached on an error which moved Alvarado to second. Next up came AUDREY BAGGE (2-3, 5 RBI, HR, 3B, 2B, 2 R) with runners on first and second, she worked the count to 2-1 and on the very next pitch ripped a triple that scored both Alvarado and Dodson, the next batter SAMANTHA MILLER reached on an error that scored Bagge to give the Cougars a 3-0 lead. The Cougars in the top of the fourth inning would do more damage offensively as Bagge would rip a double to centerfield that would score both JJ VENZOR (2-3, R) and Alvarado to make it 5-1. Dodson would score to make it 6-1. 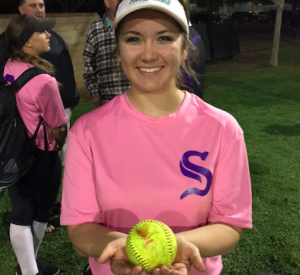 Steele Canyon would add a couple more runs thanks to a 2-run blast by MAKAYLA STROMENGER (1-3, HR, 2 RBI, R) that scored Bagge to push the score to 8-1. In the fifth inning, DePaola would help her cause again as she jacked a solo shot to make the score 9-1. On the mound it would be DePaola that would get the victory as she dominated the Lancers in allowing only 2 hits and one earned run while only walking 2 and striking out 2 in her five innings of work. SERRA 9, SWEETWATER 0 – The visiting Conquistadors of Serra High were able to have their way with the Red Devils of Sweetwater High in the 9-0 victory of the Monarch Classic, Tuesday (Mar. 8th). It was all Conquistadors as they were able to push across 3 runs in the top of the second inning thanks to a couple of Red Devil miscues, which led to three runs including an RBI single by ABIGAIL WARDEN (1-3, RBI, R). Serra in their half of the fifth inning, thanks to multiple hits, racked 5 runs, including a 2-run double by VALERIE VALADEZ and an RBI single by DARBY TIBBETTS (2-4, RBI, 2 R). Both VIVIAN TOMOVICH (2-4, RBI) and AMBER WOZNIAK (2-4, 2 RBI) would contribute with RBI singles. Tibbetts, besides at the plate where she helped her cause, also took the circle in which she dominated in the victory. She went the full distance as she allowed no runs on five hits while fanning 6. GRANITE HILLS 2, RANCHO BUENA VISTA 2 – In a Cougar Classic contest at Kit Carson Park, Tuesday (Mar. 8) the Eagles and Longhorns played to a 2-2 tie. The Eagles pushed across runs in the top of the second inning and also the third inning to lead 2-0. The Longhorns would finally breakthrough in their half of the fourth with a run to cut the lead 2-1. The Eagles couldn’t take advantage of their opportunities and the Longhorns were able to in the bottom of the sixth as they pushed across another run to tie the game at 2-2. This would be the final result as the umpires called the game due to time thus the contest resulted in a tie. Pitching for the Highlanders was at a premium as SHAREENA LaCHANCE gained her second victory of the season with a complete game shutout. She only gave up 2 hits in the process. Freshman FAITH KING led off with a double and would score on the RBI single by DESTINI BULLOCK. LaChance helped her cause in the third inning as she roped a single down the line that would score 2 runs after a very impressive 11-pitch at bat. The Highlanders would tack on 6 more runs over the final three innings. CATHEDRAL 5, VALHALLA 0 – The Valhalla Norsemen ran into a buzzsaw of Cathedral on Tuesday (Mar. 8) in their 5-0 defeat in the Cougar Classic at Kit Carson Park. Valhalla despite being overmatched played the highly rated Dons pitch for pitch for the first few innings. However in the top of the fourth inning the Dons finally got on the board and never looked back as they pushed across four runs to make it 4-0. They would tack on another run in the fifth to lead 5-0. That would be all they needed as the Norsemen couldn’t find any type of offense as they were only able to muster one hit against the Dons pitching.